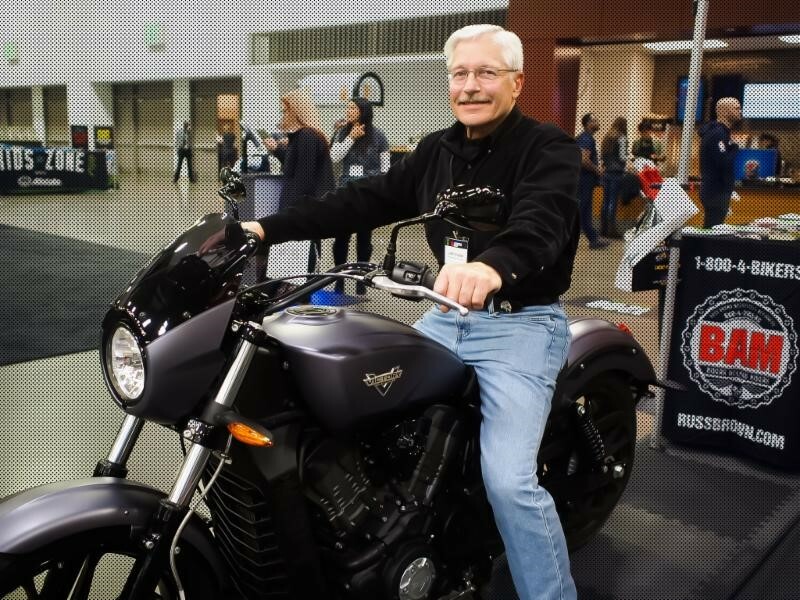 It’s the Progressive International Motorcycle Show, and Larry has just driven from his hometown of Pleasantdale, Nebraska to pick up a brand new Victory Octane. Moments before he would finally see his brand new prize ride in person, we met up with Larry and his equally excited son-in-law and grandson outside the convention center in Minneapolis to chat. (Q) Congratulations Larry! How have these past few months been for you? (L) My wife’s at home still thinking that this can’t be true! You know, I got the call and [Shawn] said he was informing me that I had won a bike, and I had to keep repeating, ‘what..what..?’, I’m thinking there’s no way this can be for real. No way! Thankfully he had the patience to stay on the line with me. (Q) It is definitely real! Has it sunk in yet? (L) *Laughs* I’m still wondering, what’s the catch? But everyone at Russ Brown has truly been so great, I just feel very grateful. (Q) Definitely no catch, it’s all about the support we have for our community, for fellow motorcyclists…how long have you been riding for Larry? (L) At around 10 I was gifted a little 1970-something scooter from my brother in law in exchange for farm work. I rode that thing up and down the country, downhill the chain would come off and I’d have to stop and fix it…eventually I got an 85 CC Kawasaki for a couple of years before advancing to a 315 Honda. In time I got a Harley, but shortly after I got married and had kids, the family life took over, so for a while I rode that probably an average of a hundred miles a year. (L) Right, as much as I love to ride, I held off for a long time until I felt the kids were old enough for me to take on some of those risks that come with motorcycling, which makes this BAM network really fantastic – it brings home those things that are concerns for all of us bikers. And it seems more important today than ever because of the aspect of cell phones and texting and whatnot. Other drivers on the road aren’t as attentive as they once were. (L) Well one year on our way back from Sturgis we had an issue, the engine light turned on…we ended up being waylaid fourteen hours to only find out that it was a security system problem that required pulling a fuse for a minute and reinserting it. That was it – we waited hours for something that could have been resolved in two minutes! Of course I had to call somebody, get us loaded up and towed into town. That would have been a great time to call BAM but of course this was before I had become a member, so I appreciate this network and service. It’s a great idea. (Q) Absolutely, that’s part of the package. So will we see you at Sturgis this year on the Victory? (L) Oh yes, my wife and I having been going annually for about 12 years and look forward to that trip every summer. Hopefully it’ll warm up near home [Nebraska] and I can give it a try tomorrow!